Who needs the Easter basket full of chocolate eggs when you’ve got this winning Easter basket cupcake, topped with tinted coconut to resemble grass and garnished with jelly bean eggs? The waffle bowls can be found in the supermarket with all the ice cream toppings. For a special presentation, decorate with cute yellow marshmallow Peeps and arrange on a platter with wheat grass surrounding the little baskets. It’s best to eat these cupcakes with a fork. Place a rack in the centre of the oven and preheat the oven to 350°F. With your child, wrap the outside of each waffle bowl in an 8-inch aluminum foil square, carefully tucking the edges of the foil just inside the top of the bowl. Remind her to be careful with the bowls! Place the bowls on a baking sheet and set aside. Have your child help put the cake mix, pudding mix, milk, oil, eggs, egg whites, and coconut flavoring in a large mixing bowl. Blend with an electric mixer on low speed for 30 seconds. Stop the machine and scrape down the sides of the bowl with a rubber spatula. Increase the mixer speed to medium and beat 2 minutes more, scraping down the sides again if needed. Your child can now help you fill each bowl with a heaping 1/2 cup of batter. Place the baking sheet in the oven. Bake the cupcakes until they are lightly golden and spring back when lightly pressed with your finger (not your child's finger! ), about 24 to 27 minutes. Remove the pan from the oven and place it on a wire rack to cool for 5 minutes. Gently peel off the aluminum foil and allow the bowls to cool to room temperature for 30 minutes. Meanwhile, prepare the buttercream frosting if you're making it yourself. Once the cupcakes and bowls have cooled, it's time to assemble the baskets! Place the flaked coconut in a plastic bag with 2 drops of the green food coloring. Give the bag to your child and tell her to shake it until the coconut turns green. If the colour isn’t strong enough, add another drop of colour, and shake again. Have your child 2 heaping tablespoons of frosting on each cupcake while you spread it out smoothly with a short metal spatula or a spoon, taking care to cover the tops completely. Immediately sprinkle on coconut to resemble grass and place a pile of jelly beans on the coconut to resemble eggs. 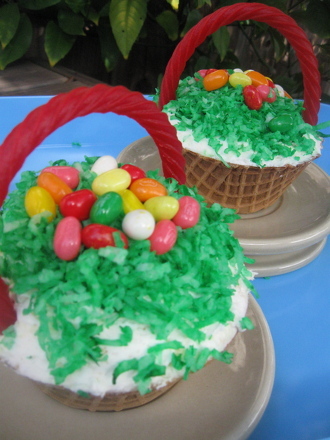 To create the basket handle, insert one end of a Twizzler in one side of the cupcake near the edge, then bend it over the cupcake and insert the other end on the opposite side. The cupcakes are ready to serve! Store these cupcakes for up to 1 day at room temperature. After a day, the cake will begin to pull away from the sides of the bowl. 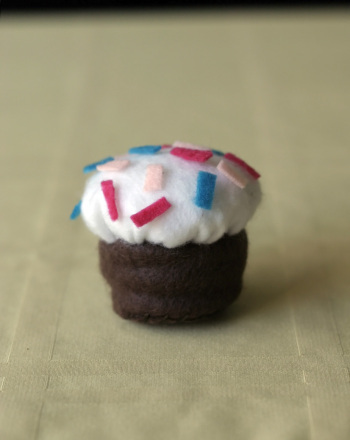 This same cupcake batter may be baked in regular-size lined cupcake pans for 16 to 20 minutes, then topped with frosting, coconut grass, and jelly beans. Cut a smaller length of Twizzler and stick it on both sides of the cupcake for the handle. 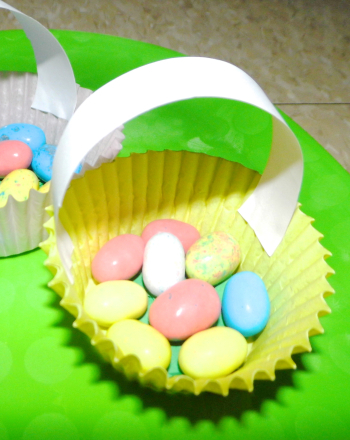 Weave colorful Easter basket pictures out of construction paper and ribbon that open to reveal an assortment of fun Easter shapes! 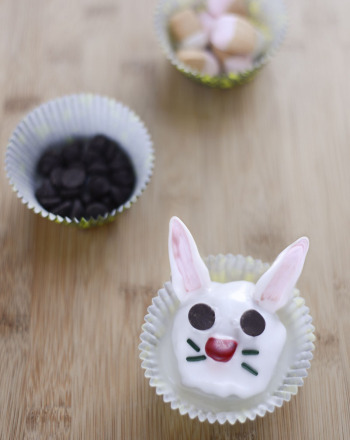 Help your child make some super cute bunny cupcakes that will be the perfect Easter dessert. 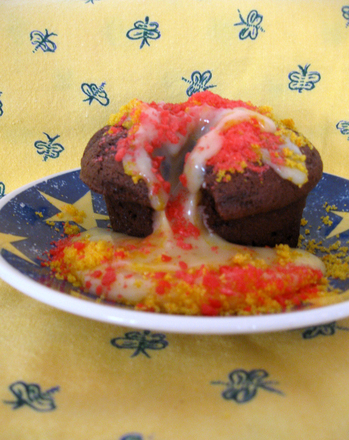 Zombie cupcakes are baked goods that look as if they've been pulled fresh from a skull. 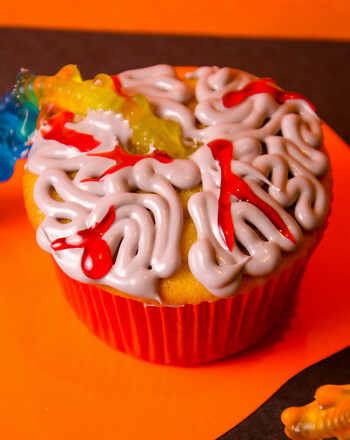 Make zombie cupcakes this Halloween. 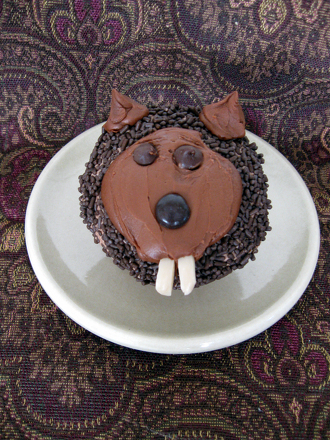 Add these fun chocolate Groundhog Day cupcakes to your holiday desert recipe repertoire! They're fun to make with your kids and a delicious winter snack. These savory cupcakes are a great way to mess with someone's taste buds. 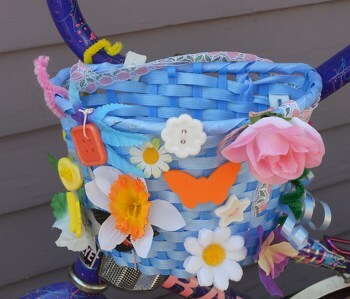 Your child can add bling to her bike with bicycle basket decorations, making her bike a stylish ride! The Easter bunny has been busy hiding colorful eggs all over the yard. 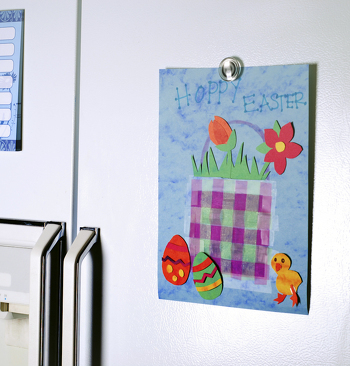 Each one has an Easter division problem for your third grader to solve. These Easter eggs are hiding the answers to the word scramble. Can you unscramble the letters to reveal words related to Easter? The Easter bunny's been busy hiding colorful eggs all over the yard. Each one has an Easter multiplication problem for your third grader to solve.